Home > Heavy Duty V Belts > Moulded Notch V-Belts. AX, BX, CX, 3VX and 5VX Sections. > AX Series. 1/2" Wide Molded Notch V-Belts > AX21 Classical V-Belt, Consumer Brand. 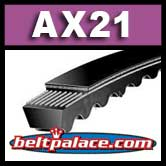 AX21 Classical V-Belt, Consumer Brand. AX21 Classical COGGED V-Belt. Consumer Brand. 1/2” Wide, 23” Length OC (13mm W x 584mm L OC). COGGED V-BELTS are better suited for smaller pulleys and deliver more power. Features bias cut, insulated high strength polyester cords, superior compression section for high temperature and load carrying performance. Meets or exceeds RMA standards for Heat and Oil resistance. High quality for low cost! Standard FHP 4LX230, 4L230 V-Belts. NAPA, Grainger, Ametric (low grade) AX21. A21 V-Belt. Consumer Brand A21 V-Belt. 1/2" Wide x 23” Length OC. Replaces Standard 4L230 FHP V-Belts.